To celebrate Veterans Day, News Match 2017 featured journalists and newsrooms whose work has lifted up critical issues impacting veterans and their families, including our recent "Insight with John Ferrugia: Serving Those Who Served" report on the VA system in Colorado. Now through Dec. 31, 2017, individual donations to RMPBS up to $1,000 each will be doubled by News Match partners, including Democracy Fund, the John S. and James L. Knight Foundation, and the John D. and Catherine T. MacArthur Foundation. Washington, DC – Ahead of Veterans Day, News Match—the largest-ever grassroots campaign to strengthen nonprofit journalism across the United States—is highlighting participating newsrooms with a proven track record of reporting on critical issues impacting veterans and their families. 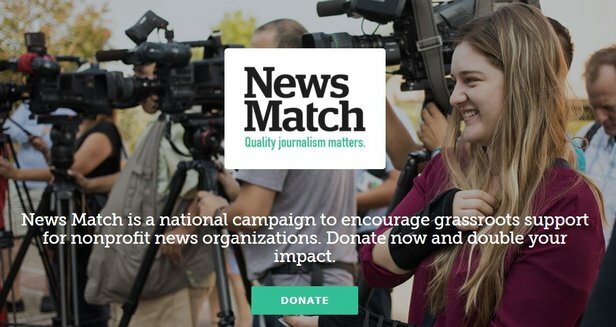 Now through Dec. 31, nonprofit newsrooms participating in the News Match campaign are eligible to receive matching funds for all individual donations up to $1,000. Anyone can contribute by visiting www.newsmatch.org—the first one-stop platform for donating to nonprofit news. News Match supports veteran-focused newsrooms like The War Horse, Connecticut Health I-Team, ProPublica, Reveal, Rocky Mountain PBS, and many others.